According to an online poll conducted by CNN – 32% of respondents were infected with this malicious virus. At the pick, each of every 17 emails contained sobig.F! Internet service provider AOL says it scanned 40.5 million emails and found the virus in more than half of them. Sobig accounted for 98 percent of all viruses found in these emails. This is a worm type of virus. Which means it is an executable program that installs enhancement to your Windows operating system. The ‘F” implies that it is the sixth of the family of Sobig viruses. The first one was launched in the beginning of this year. The latest attack was started on August 19. Sobig.F comes along with an e-mail with subject headers like Your details, Thank you!, Re: Thank you!, Re: Details, Re: Re: My details, Re: Approved, Re: Your application, Re: Wicked screensaver or Re: That movie. The body of the message is quite short and usually contains either "See the attached file for details" or "Please see the attached file for details." Once the file is opened, Sobig.F resends itself using a built-in mailing program to e-mail addresses from the infected computer. As a sender’s address it shows one of the e-mails randomly selected from the computer's address book. The worm was also supposed to attempt to retrieve an URL from a predetermined list of 20 master servers on a certain date and time. The content of that URL was to be downloaded and executed on the infected machines. Luckily those servers were identified right away and shut down. If your computer is infected or you have doubts, first thing you should do is – to check and clean up your computer from this virus. Although, it is set to deactivate on September 10, which means it will no longer multiply itself, however, left untouched, it might attempt to update itself, once the newer version of the virus comes out. 1. If you do not have latest version of anti-viruses installed, go to the Symantec’s following page. 2. Down load the Sobig.F removal tool for free of charge. • Once finished click on “OK” to close the window. • From now on all emails with the above mentioned phrases and attachments will be moved to the “Virus Spam” folder. • All you have to do is delete the emails, which will appear there. Don’t open any executable attachment in an email, unless you are hundred percent sure that this is a legitimate file that you have been expecting. Install an anti-virus program and update it on time, at the end, this might be the best possible solution to protect our computers from these ugly online creatures! E-commerce is gaining pace! Research firm eMarketer predicts that 2003 will see online sales reaching US $58.2 billion excluding travel. According to Forrester Research, another reputable research company, business to consumer e-commerce will hit US $230 billion by the year 2008. While offline retail sales are staggering and will continue to do so in near term, online retail sales will show a hefty 19 percent consecutive year over year growth! And by the same year, two third of all US households will buy some kind of products and services online. In 2003 alone 97 million consumers will make some kind of purchases through the Internet. If you are selling products and services offline, you should seriously consider hopping on to the e-commerce bandwagon, or risk loosing significant portion of your business to your more proactive competitors! That’s not all! By the year 2008, today’s best selling product – books will have a mere 3 percent share of total business to consumer online sales. You can choose to build an e-commerce website either yourself by hiring required experts, i.e. web programmers or by appointing a website developing company to do the job for you. In both of the cases, you have to be prepared to spend a significant amount of money. E-commerce site is a very broad terminology! Depending on you demand, it can cost you from a modest US $800 to any where over a million US dollar! That’s not all! You have to be prepared to spare considerable time on it, as well. Writing the technical scope, choosing the appropriate design for your site and creating proper content for your site will take a lot of your time. And there is no guarantee that you will do everything right! You can build one for a fraction of the cost, needed to create an e-commerce website. You can choose the design of your web store from numerous available templates. Simple editor allows you creating your web store all by yourself. You can be up and running within days. You can choose a merchant account from the one offered by the service provider. There are many Web Store service providers on the Internet like Yahoo! Store, Bigstep, Rusbiz, etc. Compare and choose the one, which best suits your requirement. As an added advantage, some of the Web Store service providers will integrate your store with a shopping mall or e-marketplace free of charge. This will instantly expose your web store to a large targeted prospective customer audience. If you sell only one or couple of products and do not add products or services often, you don’t require an online catalog. However, if you have a product line of over 10 products and you constantly add or change products, you should consider a web store with the facility of an online product catalog. This feature of a web store service allows rapid developing and maintaining of you electronic catalog without spending large sums on creating one by yourself. 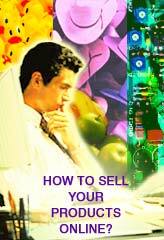 If you are planning to sell ebooks, reports, whitepapers etc. I would suggest you to consider using clickbank’s marketplace. That way, you don’t have to worry about getting a credit card merchant account.